After a rather extensive stay in the creative doldrums of the world that is my life, I actually completed a couple of small illustration projects. 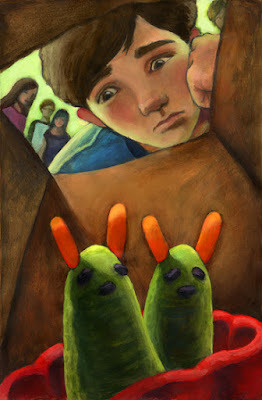 The first was an illustration for Stories For Children Magazine, an online publication with fictional stories for kids and teens. I was assigned a story geared to the older audience, entitled "Grandpa's Vegetable Habit," about a boy who's grandfather inadvertently embarrasses his grandson by packing him lunches made of vegetable animals. For this illustration, I actually ended up working exclusively in my sketchbook. I started the drawing in my recycled brown paper sketchbook and decided to add some acrylic paint, and then just continued working on it until it became the final piece. This seems a good method for me because it restrains me from taking anything too seriously or being too critical and too controlled. 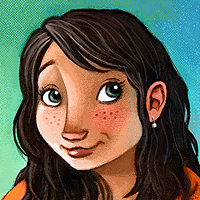 I always stiffen up when I go from sketch to finish, but I feel more daring when I work in my little book. So here it is: Lunch Bunnies. I really enjoyed working on this, having been able to read the story and choose what I wanted to represent. It finally felt like a real illustration assignment-- which is what I really need. I hate not being told what to do--- ever. I like this new found freedom from classes and all, but if I'm going to ever feel like an illustrator someday, I need assignments! But I also had fun making this piece because I had company in my studio. Adam came to visit me for the weekend and it was a nice change to share a creative space again, and to be able to bounce feedback to one another as we both worked on our respective projects. I can not wait until we finally have an apartment. Because as much as people say that two illustrators can't survive in a relationship together, with us, it seems that we do really well to inspire and motivate and encourage-- which makes the very intimidating world of freelance a lot easier to handle. Then next endeavor was a personal project, an illustration for the Children's Illustrator group on deviantART. The monthly topic was circus, and considering circuses and carnivals are two of my favorite subjects, I knew I'd kick myself if I missed the chance to participate. So I worked for a couple of nights on this, Elephant's Flying Circus. I also began this illustration in my sketchbook, but then scanned the painting and continued to work digitally until it was finished. I'd say it is now about 70% digital. I would have liked to do more with it, but I was pressed for time and I really need to focus on my first real freelance project, which is due Mid October. But before that, I will be participating in the Providence Street Painting Festival this Saturday, and I am really excited as it is my first time, and it should be a good deal of fun! I have a small 4x4 square, but hopefully it will go allright! Mmmm. It does feel good to be more productive than usual! 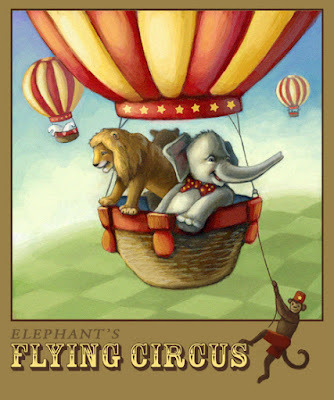 I really like hot air balloons, so the Elephant's Flying Circus picture looks great to me.